Book hotel rooms online with us at Vila Gale Nautico - All Inclusive Hotel at the lowest rate, guaranteed. 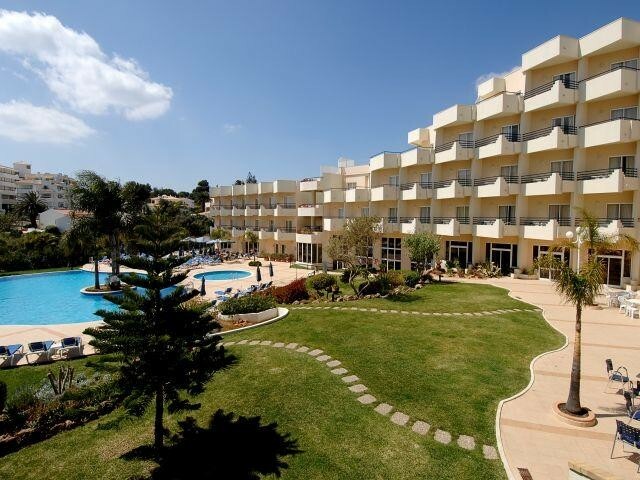 Get your holiday discount room rate at the 4 Star Vila Gale Nautico Hotel - All Inclusive - is located to the west of Armacao de Pera in the western Algarve. The hotel garden overlooks the ocean and is a very short walk to the beach. The hotel has 233 bedrooms providing holiday accommodation for two adults and with wheelchair access. They are all well decorated with modern comfortable furnishings. The Vila Gale Nautico Hotel - All Inclusive a�� with all food and normal drinks are included in the cost of the room which have balconies and are equipped with satellite TV, direct phone, radio and a mini-bar. Vila Gale Nautico Hotel - All Inclusive - facilities include its Health Club with massages and treatments, an indoor pool, sauna and steam baths, a restaurant, a snack-bar, two bars, an outdoor pool and one for children, Wi-Fi, a Fitness Centre, a Kids Club in season with a playground and a games room. Garaging is available. The hotel is only eleven minutes walk to the town centre. There are three 18-hole golf courses in the near vicinity.